In the midst of hurricanes, earthquakes and wildfires, I once again have begun to wonder why it takes a disaster for us to look beyond our differences and pull together? Why does it take a tragic event destroying people’s lives before we choose to respond as loving neighbors? When asked what is the greatest commandment, Jesus responds, “‘You shall love the Lord your God with all your heart, and with all your soul, and with all your mind. And the second is like it: ‘You shall love your neighbor as yourself.’” Love is the key to being a good neighbor. True love sets aside personal judgment, divisions, differences, and fears for the sake of the well being of others and the community. When we see the lives of others devastated by natural disasters, our hearts can’t take in the magnitude of the destruction. There is a desire that grows in us to reach out in comfort and care no matter who the people are. The invisible fence that subconsciously divides us on a daily basis, seems to melt away in the face of misery and despair. Why does it take misery and despair to meet our neighbor? I think what divides us is our fear of someone who may look or believe differently than we do. I think some of our neighbors may feel judged and dismissed as citizens of our beautiful city, leaving them to feel unacceptable. I think we need to ask ourselves how might our actions contribute to these feelings? Or how might our lack of action contribute to these feelings? I’ve been a part of a new group in Delaware called the Delaware Community Coalition. This group to be blunt is working on building race relations in our city. This group believes that neighbors need to know neighbors. They believe that community is built and strengthened by getting to know each other better. I believe we fear who or what we don’t know. This group is a work in progress. It’s difficult to tackle fears. It’s difficult to build bridges over the invisible titanium lines that separate one neighborhood from another. But we continue our work because we believe it is vital. As a group, we have come from different backgrounds and neighborhoods. We have grown to love and respect each other. I believe that love starts at home. Those who know me may not believe this about me but I am pretty shy. I don’t just walk up to someone I don’t know and start a conversation. About six months ago though, I decided that I was going to greet everyone I passed with a “Hello” and a smile. So as I walk down Winter Street, or make my way downtown or through the grocery store, when I make eye contact I take the time to smile and say hello. If I am out kayaking and pass another boat, I greet them. What I have learned is that people smile back and I often notice a change in their posture, a strengthening of their being, a brightening of their soul. Greeting someone acknowledges that they are valued. It is a starting point to being a good neighbor. I love God with all my heart and with all my soul and because of that I can’t help but love my neighbor near and far. It is part of my DNA. Being a good neighbor begins right here in our own city. I invite you all to be courageous, be loving and reach out and build relationships across our city. Let’s not wait for some disaster to strike before we get to know and care for one another. Rev. 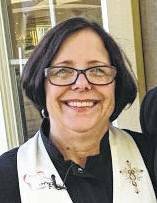 Deb Patterson is pastor of First Presbyterian Church in Delaware.